The Kansas Speedway is a 1.5-mile tri-oval race track in Kansas City, Kansas. 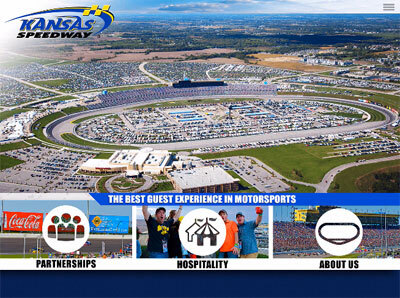 It was built in 2001 and it currently hosts two annual NASCAR race weekends. The Verizon IndyCar Series also held races at the venue until 2011. The Challenge: Improve complex corporate sales efforts with a dynamic sales app that allows visual access to all sponsorship opportunities and program details. Share past sponsor examples, images, and videos to share the excitement of race day, when the stands are full of race fans, and all of the exposure for their corporate sponsors. Contact us by completing this form and one of our experts will be in touch to answer all of your questions, and to learn more about your business needs for a mobile app. Are you a real person? What's the answer?